A Massachusetts man and his young niece were hurt Sunday afternoon when a jet ski they were riding on in Lake Winnipesaukee, New Hampshire, blew apart. According to Marine Patrol, who responded to the incident, the man broke his pelvis and the child, 8, suffered a laceration to her head. Both victims were taken to an area hospital for treatment. Marine Patrol officials are still investigating what may have caused the incident with the watercraft, but were able to put the jet ski back together when they arrived on scene. Watercraft and motorboat incidents happen all the time for a variety of reasons. While human error is usually to blame, people do not often think about the mechanical dangers of watercraft and boats, and often these mechanical failures blindside victims. What may start out as a fun day out on the water, can end in tragedy. 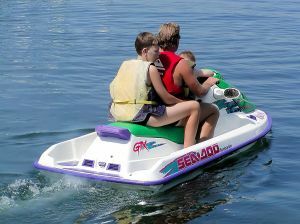 When a jet ski accident does occur, the machine itself must be thoroughly inspected. Investigators often cite mechanical errors, design flaws, or other safety malfunctions as the causes of many of these types of crashes. Some of these types of safety issues may include complications with the propeller, gross overpowering or issues with the throttle, as well as issues with the fuel line. If you were involved in any type of watercraft incident, whether it was a motorboat accident or jet-ski accident, and you believe it was the result of defective design or malfunction, you may be eligible for compensation. Product manufacturers, distributors, wholesalers, and private sellers are supposed to guarantee that the products they are selling are safe for consumers’ use. When they fail to fulfill their obligations, and consumers are seriously injured or killed as a result of this failure, the injured victim and his or her family may file for damages against the liable party or parties. Grounds for a Massachusetts products liability lawsuit related to any of these defects can include negligence, breach of warranty, and misrepresentation. In general, a product can be found “defective” if it poses a hazard that could be foreseen by the manufacturer or someone in the chain of production. Even when a product is designed, manufactured, and marketed correctly, a person can still get hurt if the product malfunctions. Massachusetts’s products liability law holds manufacturers and sellers strictly liable-even if they didn’t do anything to contribute to the defect, and the plaintiff is able to prove that a design defect directly contributed to the accident. At the law offices of Altman & Altman, we have nearly fifty years of experience handling products liability cases. If you or a loved one was involved in a jet ski or watercraft accident, and believe the accident was caused by a manufacturing defect, call one of our seasoned Massachusetts Product Liability Attorneys today to schedule a free initial consultation. Upon evaluating your case, we will determine whether you have grounds to file a case against the manufacturer and/or seller of the defective product. We will also be able to determine coverage from any injuries you may have sustained. That is, reimbursement for any medical expenses, therapy, lost wages, and/or compensation for pain and suffering, directly related to your injury. If you have any questions about a potential case, do not hesitate to call our office. Our attorneys are available 24/7 to answer any questions you have, and all inquiries are kept confidential.